To get accurate body measurements, use a tape measure, keeping the tape taut but not stretched. Get a friend to help, if possible, measuring your body over properly-fitting undergarments while standing erect, without shoes, and with feet approximately 6 inches apart. For consistency, take all measurements from the same side of the body. Regular or Long Rise? Rise is the distance between your waist and crotch seam. Choose Long Rise if you are 6'1" or taller, high-waisted. Cuff or Hem information: Most pants can be cuffed or hemmed to the nearest 1/2". If no inseam length is specified, your trousers or pants will arrive unfinished. Bust: If possible, get a friend to help. With arms relaxed at your sides, measure the fullest part of your bust, keeping the tape parallel to the floor. Height: Stand in stocking feet with your feet slightly apart and your back to a wall. Measure from the floor to the top of your head. Waist: Measure around your waist, in your underwear, at the point where your trousers would normally ride. Keep one finger between the tape and your body. Hips: Stand with your heels together, and measure round the fullest part of your hips, keeping the tape parallel to the floor. Rise: Hold the tape at the center back of your waist. Run the tape between your legs, pulling comfortably at the crotch, and up to your natural waist in front. The total measurement is your rise. Inseam: Select a pair of your best-fitting pants of a similar material. Measure from the crotch to the bottom. The number of inches, to the nearest half-inch, is the inseam length. Regular, Petite, Tall or 18W-26W? Regular describes a well-proportioned body 5'4"-5'7 1/2" tall, with hips slightly larger than bust. Petite, at 4'11"-5'3 1/2" tall, is not only shorter but also proportioned smaller, scaled down in shoulder width and sleeve length. Tall, at 5'8"-6' 1/2", accommodates long torsos. Body length increases 1 1/2" and sleeve length increases 1" from our Regular fit. Women's 18W-26W is proportioned to flatter full-figured women 5'4"-5'7 1/2" tall. Compared to our Size 18, Size 18W is 2" larger in the bust, waist and hip. Arm girths are larger. Shoulder widths are shorter. Chest: With arms relaxed at your sides, measure around your chest at the armpits, over the highest part of your chest and shoulder blades, keeping the tape parallel to the floor. Overarm (sport coat sizing): Measure around your chest including the fullest part of your arms at the highest point of your shoulder blades, keeping the tape parallel to the floor. If this measurement is 7 or more inches larger than your chest measurement, order the next larger size sportcoat to avoid binding in the upper arm and shoulder area. Hips: Stand with your heels together, and measure around the fullest part of your hips, keeping the tape parallel to the floor. Inseam: Select a pair of your best-fitting pants of a similar material. Measure from the crotch intersection to the bottom. The number of inches, to the nearest half-inch, is the inseam length. Regular, Tall, Trim, Short or Big? Regular describes a well-proportioned body 5'8" — 6' 1/2" tall, with hips and chest of equal girth. Tall describes a body 6'1" — 6'3" tall, with a long torso or sleeve length. Body length of shirts is 2" longer than Regular. Coat sleeve and body length is 1-1/2" longer. Short describes a body of 5'3" — 5'7 1/2", with a short torso or sleeve length. The garment body is 2" shorter and sleeves are 1 1/2" shorter than Regular. Big describes a body of 5'8" — 6' 1/2" with a less athletic profile. Pockets and other details increase in size for a pleasing proportion. Trim dress shirts, available in some styles and sizes, are tapered, with a 5" drop from chest to waist. Hat: Measure around your head with the tape above your brow ridges. 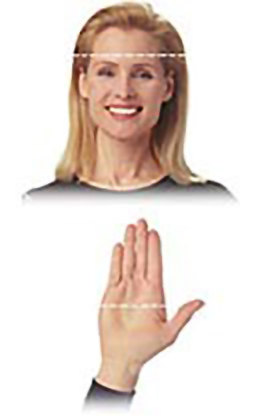 Gloves: Measure around your dominant hand at the fullest part (excluding your thumb). If the tape measures 26", order a size 26 belt. If the tape measures 27", order the next larger size (size 28) belt. Ties: Generally, men fit in a Regular size tie 57" long. You tie a Half Windsor or Full Windsor knot. IF YOU NEED HELP, CALL!